This page is for the original release. For the remaster, see Dark Souls Remastered. A port of the console versions of the game with few configurable options. Use DSfix to increase rendering resolution and remove the 30 FPS cap along with many other options. Using a controller is strongly recommended over keyboard and mouse controls. 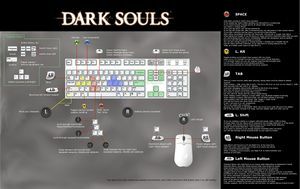 If using keyboard and mouse controls, use Dark Souls Input Customizer to fix mouse control issues. Games for Windows - LIVE DRM was removed from the Steam version on February 16, 2015; product keys activate on Steam. The game is no longer available for purchase on Steam as of May 9th, 2018. High-resolution textures, fonts, and controller button prompts are available to download (requires DSfix). Dark Souls Configuration Utility is a launcher, mod manager, and configuration tool which bundles many of the following (and other) mods. Unmodded and DSfix modded game. Modded at 1920x1080 resolution - Eurogamer. DSfix increases the rendering resolution for better visual quality; without it the game outputs anamorphic 1024x720. It also allows the 30 FPS cap to be removed, HD or other alternate textures to be used, as well as giving options for anti-aliasing (AA), screen space ambient occlusion (SSAO), depth of field (DOF) blurring, anisotropic filtering (AF) and many other features. Raising the FPS cap introduces minor clipping problems. It is, however, generally safe to play at 60 FPS, and you will be unlikely to encounter any issues. See High frame rate for more information. Download the latest version of DSfix. Extract DSfix into the DATA folder in the installation folder. Edit DSfix.ini to set your resolution (for example, renderWidth 1366 renderHeight 768). Set a resolution higher than your native display if you want a supersampling anti-aliasing (SSAA) effect. 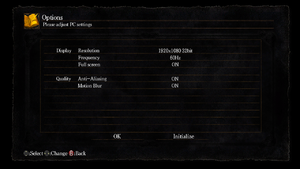 The Dark Souls Input Customizer (DSIC) allows full customization of the controls of Dark Souls. It uses an intuitive input system that allows the rebinding of every action to arbitrary combinations of keys or buttons on the controller, mouse or keyboard. Although this can in part also be achieved with existing tools, DSIC is much more flexible and wraps it all up in an easy to use package, with additional functionality that is specially tailored to Dark Souls. DSIC also fully includes the Dark Souls Mouse Fix, which does not have to be installed separately. A Title Update is available for the Games for Windows - LIVE version. The game should automatically prompt for the update when using a LIVE profile; the update can also be downloaded manually (Title Update 1, Title Update 2, Title Update 3 - extract the contents and run TitleUpdate.msi). For the Games for Windows - LIVE version %LOCALAPPDATA%\Microsoft\XLive must also be backed up. Syncs up to 100 MB of save data. 1024x720 internal resolution. Use DSfix to fix. Use Dark Souls FOV Fix (Steam only). Creates an overly blurry effect (disable when using DSfix). See Anti-aliasing (AA). Capped at 30 FPS, see High frame rate. Use DSfix together with Widescreen Fixer. For v1.0.2 & v1.0.3 use the updated Widescreen Fixer plugin. Select windowed mode in the game settings. If you leave it on fullscreen mode, the game will crash if you alt-tab. Anti aliasing may be forced with the compatibility flag 0x004000C0. Sparse Grid Supersampling gives a blurry effect. Multisampling combined with transparency supersampling seems to work well (this author uses 4x on each). Some dark diagonal line artefacts are visible on my system occasionally with these settings but aren't obtrusive. DSfix's antialiasing should be turned off for this. Optionally, change FPSlimit 60 to the desired frame rate cap. Short ladder leading to three firebomb throwing hollows warriors. The entrance to Pinwheel's crypt. Chance to "run" slower than you walk when frame rate is over 60 FPS. Jump/roll distance is slightly reduced at 60 FPS. Slope interactions are slightly different at 60 FPS, may cause getting "stuck" on small obstructions from time to time. Undead Dragon's "toxic sludge" doesn't render properly when playing at 60 FPS. By default, DSfix includes a hotkey to toggle unlockFPS mid game. Simply press ← Backspace at any time to switch between 30 FPS and your configured FPSlimit. Only use one of the below methods; not both at the same time! Scroll down to the Ambient Occlusion section and change the parameters as desired. Change Profiles to Dark Souls. Use Dark Souls Input Customizer for more remapping options. Mouse deceleration reported. Use Dark Souls Input Customizer to disable it. Use Dark Souls Input Customizer for more sensitivity options. Entering a name for a new character requires keyboard. Use Dark Souls Input Customizer. Use PS3 Original Interface Icons and Gesture Menu for DualShock, Use Xbox One Interface Icons Mod for Xbox and use Steam Controler Glyphs Mod for Steam Controller. Use DSfix and Dark Souls Input Customizer. UPnP is working in the Games for Windows - LIVE version if the Games for Windows - LIVE Network Settings says "UPnP is available, in use"; if not, refer to this guide. Dark Souls PVP Watchdog is a tool designed to prevent some common forms of cheating and tampering in online sessions, and gives the player the ability to ban offenders from their worlds. Disclaimer: read the overview in the first link. Should an offender invade your world (or should you invade the world of a cheater), press F1 to disconnect the offender, or press F5 to ignore the warning. Dangerous effects like curse, petrify, egg head, and teleport are disabled and prevented during invasions and don't need any user interaction. The problem: Recent versions of Dark Souls have trouble connecting to other nodes, making Multiplayer difficult or even impossible. Dark Souls Connectivity Mod is a tool that attaches itself to Dark Souls process, allowing it to connect to player nodes. A side-effect of being able to choose a node, Co-Op and PvP with select players becomes possible. Download and extract DSCM to a folder of your choice. Simply run DSCM whenever you play Dark Souls. By default DSCM should already connect you to DSCM-Net, improving multiplayer connectivity. DSCM and Dark Souls do not need to be started in any specific order. You can run DSCM before starting Dark Souls, or you can run DSCM after the game is already open. DSCM will "just work" no matter when it is started. The game suffers from poor Nvidia 3D Vision support. 3D does not work with borderless fullscreen. Download the fix from Helix Mod's web site. Reportedly working with Nvidia cards. Set priority of DATA.exe to a higher value. Set processor affinity to only 2 of the available processors. Set a resolution lower than your native display to improve performance on older machines, at the cost of up-scaled blurriness and aliasing. Certain areas of the game are more demanding on your hardware causing slowdown in-game. It seems that the engine, when faced with an area where it struggles to render 30 FPS, will cut down to 15FPS. The most famous is Blighttown, but large animated characters can also produce this slowdown. Unlock the FPS cap with DSfix (unlockFPS 1), set the frame cap at 30 (FPSlimit 30) and enable Vsync (enableVsync 1) For the most part you will have the same experience, but where the game would usually dip to 15FPS it will only drop as far as it needs to (results depend on your machine). Appears that ATI/AMD graphics cards are underutilised. Enter Catalyst Control Center and 3D Application Settings (advanced view). Tweak settings by unchecking 'Use application settings' and switching sliders to the left. Apply the 3D profile to Dark Souls. Disabling AMD Cool 'N Quiet in your BIOS can also fix the issue with low FPS. Go to Nvidia Control Panel (Control Panel > Hardware and Sound > NVIDIA Control Panel). Go to Manage 3D Settings > Program Settings. Add both executables (DARKSOULS.exe and DATA.exe), and set the preferred graphics processor for both to Nvidia graphics instead of auto. Crash occurs after start screen. 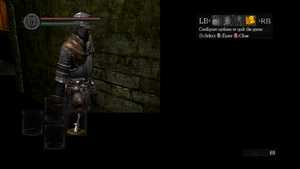 Option 1: Use borderlessFullscreen and set RefreshRate = 60 in DarkSouls.ini. This setting is ignored when Dark Souls is not in true fullscreen- your desktop refresh rate will not be changed and the game won't crash when accessing the settings. Option 2: Make sure your monitor is set to 60Hz before attempting to access in-game PC Settings. The crash only happens when trying to access the in-game PC Settings; it is safe to use any frequency after you have finished adjusting in-game settings. Option 3: Don't even try to access the in game PC Settings, just edit DarkSouls.ini by hand. When creating your first character, the settings may automatically be accessed. If none of this works, try downloading the latest windows essentials and signing in. Right click DATA.exe and go to Properties. Go to the Compatibility tab and uncheck Run as Administrator. Right click DARKSOULS.exe and go to Properties. Go to the Compatibility tab and check Run this program in compatibility mode for:. Select Windows 7 from the drop down list. Reading a summoning sign causes Dark Souls to crash to desktop. Use X360ce to fix the issue by emulating the official Xbox 360 Controller. Start xBox360ce.exe and confirm creation of all DLLs. Controller should be detected. Test all buttons and sticks. Add a line HookCOM=1 after HookMode=1. Open Dark Souls, which should now detect the non-Xbox 360 Controller as an official Xbox 360 Controller. Mouse controls feel very jittery, with unintuitive results when the camera collides with a wall or the floor. Use Modern keyboard interface icons. Set RefreshRate to the screen refresh rate, e.g. RefreshRate = 120. The game's window remains black after launching and is "Not Responding" if clicked on. The issue can also occur when a USB DAC is plugged in i.e. Fiio E17K. Click Add and navigate to <path-to-game>\darksouls.exe. No profile changes are necessary. Click Apply, then run the game. Make sure the game isn't running. Under Human Interface Devices disable HID-compliant game controller. Plug in your USB DAC. Under Human Interface Devices disable HID-Compliant consumer control device. Fix binds the mouse to a single screen (DSFix has this feature built in). Set DARKSOULS.exe in the 'Open Program' field. Set DATA.exe in the 'Lock Program' field. Click 'Create Shortcut', and run the game using this shortcut. Problem may be caused by setup utility getting stuck whilst installing DirectX and Games for Windows - LIVE. Make sure DirectX and Games for Windows - LIVE are individually updated. Open the Task Manager (Ctrl+⇧ Shift+Esc) and go to the 'Processes' tab. When dxsetup or gfwlsetup show up, cancel the processes. Note: the gfwlsetup may appear only briefly. This should allow installation to continue. Useful if the automatic conversion fails. However, this will only transfer your game state WITHOUT your achievements. Open the save game folder located in %USERPROFILE%\Documents\NBGI\DarkSouls\. You will find a folder named after your GFWL profile. Open it and copy the file named DRAKS0005.sl2. Go back one level and paste said file into %USERPROFILE%\Documents\NBGI\DarkSouls\. Using DSfix with in-game anti-aliasing enabled causes the game to only use part of the screen. The issue is that Steam is trying to install Gfwlivesetup.exe but Steam also stopped supplying the executable with new downloads. Launch the game and it will ask for UAC one last time. Steamworks, Games for Windows - LIVE Steam version uses Steamworks, non-Steam uses GFWL. ↑ Games for Windows - LIVE DRM features: Legacy+ZDPP activation, supports local profiles. ↑ 2.0 2.1 File/folder structure within this directory reflects the path(s) listed for Windows and/or Steam game data (use Wine regedit to access Windows registry paths). Games with Steam Cloud support may store data in ~/.steam/steam/userdata/<user-id>/211420/ in addition to or instead of this directory. The app ID (211420) may differ in some cases. Treat backslashes as forward slashes. See the glossary page for details. "It's mostly older titles, yeah, but there were a few more recent ones, and Dark Souls definitely does work: It has ZDPP, but not SSA (I have NO IDEA why that page keeps getting updated to show that it has SSA, because it definitely doesn't; the Wikipedia page is the same way). The nice thing about ZDPP is that once the files are decrypted, you can back them up like save data and just overwrite the encrypted versions that are put there after a fresh installation, and everything starts exactly how it should. I've tested this myself, and I was able to get the game running from a brand-new installation completely offline. EDIT: I don't have much going on today, so I tried my retail copy of the GFWL version of Dark Souls, and it worked perfectly. Complete offline installation on a machine that had never had anything related to GFWL installed on it before, and I was playing in about 20 minutes. I even got an old save file to load!" 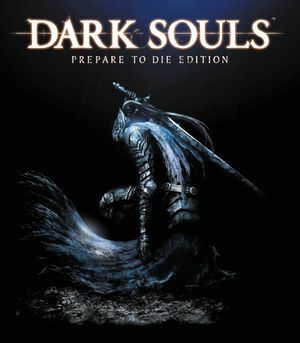 Confirmed myself using a retail copy of the game, the ZDPP extracted files (DARKSOULS.exe, fmod_event.dll, fmodex.dll) and a virtual machine disconnected from the Internet. The game is playable using no profile at all (progress can't be saved) as well as when using a local profile (progress can be saved). No server-side activation required to start playing the game after the ZDPP files have been extracted. "The original version of Dark Souls will be de-listed from the Steam store page on May 9th 2018, note that this will only effect the Steam store page listing (meaning it can no longer be purchased). The actual game in your library and multiplayer for the game will continue to be there and will not be removed." ↑ Reddit: AMD Users Having Trouble Running Dark Souls? This page was last edited on 8 April 2019, at 04:51.